Cephrael's Hand: A Pattern of Shadow & Light Book One by Melissa McPhail follows three men and their destinies and the decisions they make. Prince Ean val Lorian is the last heir to the Eagle Throne in the Dannym. When his brother is killed in an attempt to kill the last heir, Ean wants to know who killed his blood brother and he wants revenge. However, only time will tell if the people around him are loyal to him or someone far more powerful. Trell, a soldier in the Nadori desert, wants to know what happened in his past. He is bound by honor to the First Lord, but stranger things are afoot. Something big and bad is happening and he is honor bound to do as the First Lord bids him. However, with every secret he uncovers, the darker the future appears. Adept Vestal Raine D'Lacourte is the only one who can save his dying race. In order to do that, he has to find the one and only man who knows what it takes; however, finding him is very hard. He was deemed a traitor three centuries ago. Can D'Lacourte find him in time? And will he help? The fragmented narrative was handled perfectly by McPhail. The dialogues revealed a lot about the characters. I absolutely loved Trell. He was conflicted and looking for answers. He was one of the most powerfully built characters that deserves a round of applause. I cannot wait for the next novel to see where Trell is and what is he doing. He is a strong, amazing character. 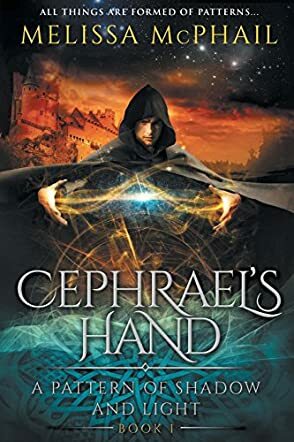 Cephrael's Hand: A Pattern of Shadow & Light Book One by Melissa McPhail is an amalgamation of some superb and amazing things and some conflicting ideas (which I am guessing will be cleared up in the sequel) that together make a very powerful novel. Brilliantly written and well handled.